It was a great pleasure to have the opportunity to train and learn from Masters from around the Federation. Masters and Masters Candidates came from as far away as Colorado, New Mexico, and Texas and from all over the Southeast and the Northeast. Most of the students from the New England Region had not yet had the pleasure of meeting these outstanding instructors and leaders before camp. Each and every Master including Kwan Jang Nim St. James took time out of their very busy training schedules to make sure they greeted everyone and made us all at camp feel like part of the family. To me that is the true meaning of serve, lead, and inspire. 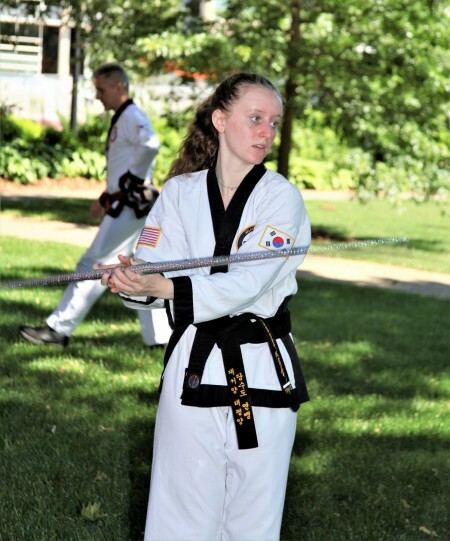 Kodanja began at 8 am Friday morning where 35 Masters and Master Candidates were to spend many rigorous hours training both physically, mentally and with definite Moo Do Shim Gong (martial spirit). Some members of the Kodanja group took time from their own training to help teach New England Black Belt classes which demonstrated once again their passion and focus to serve, lead and inspire. They also served as regional examiners for our spring cycle Dan Shim Sa. This was done while the Kwan Jang Nim oversaw a Kodanja Shim Sa for Masters and candidates being tested and reviewed to ranks ranging from 4th Degree Black Belt to 7th Degree Senior International Master. Black Belt Camp started out Friday night with Master Christian Klacko, 6th Degree Black Belt and Senior Master Jason Duva, 5th Degree Black Belt and New England Regional Director giving the camp orientation to all campers. The first workout of the camp consisted of a large group of campers doing group open hand forms (hyungs) with Master Antonio Rivera Jr., 6th Degree Black Belt. Master Rivera kept the energy and excitement very high. This was followed by breaking out into smaller groups to practice the forms needed for the next testing cycle. The Dan Shim Sa was held Saturday morning with the written test proctored by Bu Sabom Jason Green starting at 7 am. After breakfast and the annual group photo, the physical test was conducted by Bu Sabom Dan Maibor starting at 9 am. This was the largest Dan Shim Sa for the New England Region with 15 testing and 11 pre testers to keep the energy level exceptionally high from start to finish. It was my pleasure to be part of the Dan Shim Sa and to see such great Moo Do demonstrated from start to finish. While the Dan Shim Sa was being held, non-testing students attended classes on sparring, mastering your kicks, and weapon fundamentals. After lunch all Black Belt campers had lessons in practical self- defense and ground work while the Master’s and candidate worked on advanced self-defense, weapons, and the healing arts (acupressure). CIT (Certified Instructor Trainees) and Federation certified instructors met to discuss “Teaching from a Teachers Perspective” which was taught by Master Mark Farquharson, 5th Degree Black Belt from Denver, Colorado. One of the highlights of the weekend was a special dinner Saturday night as the Master’s all sat at different tables with the campers and were able to spend time talking getting to know each other. This “Meet the Masters” format was a great way to raise the spirit of camp to an even higher level than it already was. After dinner we were honored with a speech from Master Leif Becker (a Life Time Member of the APTSDF) on Breaking Barriers and the Circle of Mastery and also a speech from the Kwan Jang Nim which focused on the camp’s theme (serving, leading, and inspiring). This gave us all food for thought and new goals to reach for. During this time the younger campers were allowed time to relax and watch a movie to unwind from the busy day. Sunday morning campers worked on forms before coming together to work with the Kwan Jang Nim on bong mechanics from A to Z. This gave every student the desire to strive to be as exceptional with the Bong as our leader. Camp ended with all Masters and campers coming together for our traditional ending class which is group hyung lead by Kwan Jang Nim to the beat of the drum. The energy was electrifying with so many leaders and campers working together to perform as one. Even more amazing was the class was held in the same gym as where basketball was first created by James Naismith back the late 1800’s. 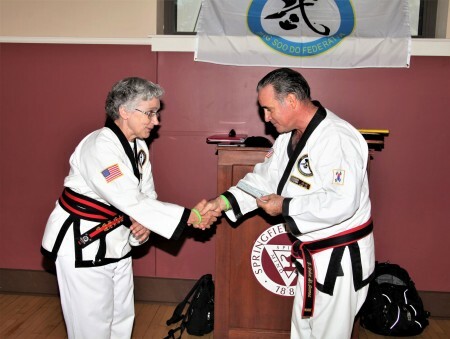 Campers also had the pleasure during the closing ceremonies to witness a donation given to Master Kathleen Navarra, 4th Degree Black Belt for the wonderful work that she does teaching at-risk students. Master Navarra had just completed the first ever APTSDF At-Risk Leadership Camp in Birmingham, Alabama which included her picking up all participants in a bus and bringing them to camp. The grant of $1,000 was to defray costs associated with this first ever at-risk leadership camp. We should all strive to be as wonderful a role model as Master Navarra!